For a long time now, Tag Heuer has earned a stellar reputation for its trackside innovation and invention. 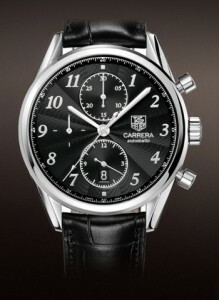 With the help of the Tag Heuer Carrera Men’s Chronograph CAS2111.BA0730 they might just reinvent you. This driving champ has no numbers on its polished bezel, just classic styling that’s offset with an azurage embossment and blue color scheme. Made for those who don’t want the whole cockpit on their wrist, it’s clean and sporty look is not overdone. The dial is an engraved flinqué, intersecting straight and wavy lines to produce a subtle illusion of slope at each hour position. Azurage embossing brings dark color to the sub-dials and hands, while the hour numbers and indexes are a slightly lighter blue. Understated chronographic sub-dials at 12, 6, and 9 offer all the performance for pro competitions, but don’t compete for attention. The hour sub-dial at the 6 also opens to a black and white date window. And it’s rated for 100 meter water resistance, so this piece will withstand anything but the deepest sea adventures. The vintage-looking Tag Heuer Carrera CAS2110.FC6266 uses silver tones on a black dial. Tag Heuer’s history of chronographic inventions is no secret. Especially in car racing, which this watch’s collection celebrates. And many are the watches in the Carrera collection that pay more tribute to a driver. So if that’s what you’re after, you’re better off digging a little deeper into the collection. If you like the understated look of this numbered face that contrasts white, silver and blue, it’s offered several ways. In addition to the polished steel, the band also comes in blue, black or brown alligator skin. There are also less colorful options within this Carrera series, like the timepiece on the right. Instead of azurage embossment, this black-dialed option is contrasted only with polished steel. 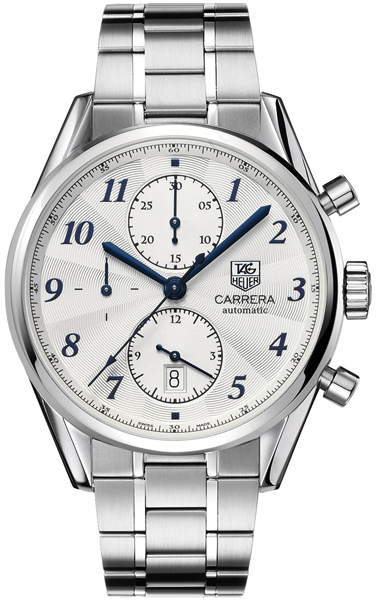 Priced at $4,300, the Carrera Men’s Chronograph CAS2111.BA0730 is made for both race enthusiasts and those with unique standards of style. It is, however, available online for around $3,000 from a few sites, so looking around will save you some money. 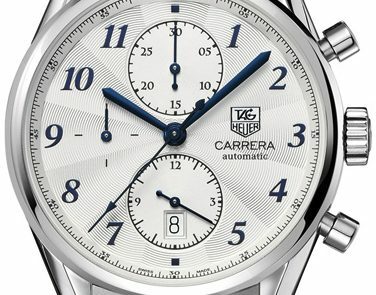 Tag Heuer is well known for it’s high quality, so whether this watch is for you will depend more on color preference. The two-toned blue color scheme won’t be for everyone, but other options in the series complement more traditionally with gold or rose gold. Still, I love the vintage look of that black and silver option most.